For its demonstration, Navy officials spent $12 million on 450,000 gallons of fuel, or approximately $26 a gallon. Combining the fuel with petroleum in a 50-50 mixture reduces the cost per gallon to around $15, more than four times the cost of petroleum alone. The company providing the Navy’s biofuel, Solazyme, was a recipient of stimulus grant funding. The report from Reuters also indicated that among Gevo’s financial backers is Vinod Khosla, a venture capitalist whose firm owns 27 percent of the company. Reuters noted that Khosla has donated overwhelmingly to Democratic candidates in recent elections. Secretary of the Navy Ray Mabus has repeatedly touted the benefits of expanding the Navy’s use of alternative fuel sources such as biofuels. “It was worthwhile to show that biofuels can compete and can be used in every single thing that we do in the Navy. Everything before now has been a test. 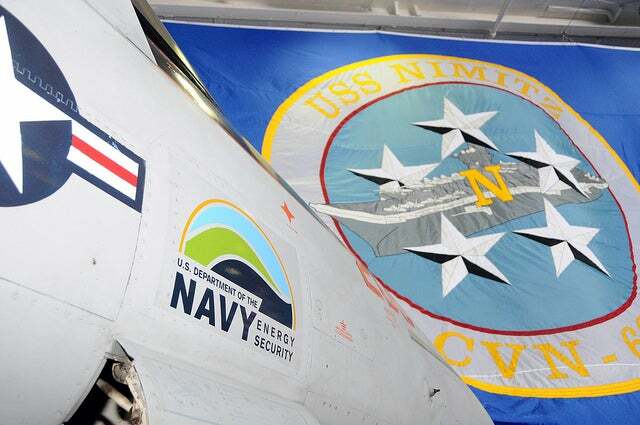 This shows that we can use biofuels and other alternative energies in an operational manner,” said Mabus in a conference call following the Naval exercise’s conclusion. Mabus and other Defense Department officials have cited increases in petroleum prices as the reason for exploring biofuel integration, which drew criticism from Republican officials. “You are not the secretary of energy, you are the secretary of the Navy,” said Rep. Randy Forbes (R-VA). Forbes says he supports green energy, but facing budget priorities, finds the expenses inappropriate. The test of Gevo biofuels occurred in late June in Florida. Gevo’s president praised the opportunity to test the company’s product. “This is a great accomplishment for the USAF, Gevo and the biofuels industry. We’ve validated that ATJ from isobutanol is a clean burning, homegrown, drop-in jet fuel,” said Chris Ryan in a statement. How the company will reach commercialization and scale production to levels necessary to meet purchase demands from the Department of Defense relies on the future construction of a commercial-scale refinery. Currently, the company produces only 7,500 to 8,000 gallons of biofuel per month. The Air Force’s purchase represents more than a month’s worth of production. The Pentagon issued a report in 2011, “Opportunities for DoD use of Alternative and Renewable Fuels,” which highlights the expected production gap between departmental demand and the projected supply of the so-called “drop-in” fuels by 2020. That gap exceeds 450 million gallons between expected demand and the highest production estimate available. Even should economies of scale and commercial-size refining capabilities be attained, the Pentagon still expects to pay a $2.2 billion premium on annual fuel costs by 2020. Per gallon premiums are estimated to be between $1.43 and $5.24 by 2015. The premium represents a 10 percent to 15 percent increase over currently-used “conventional petroleum fuels,” according to the report. Wired highlighted the gap between projected demand and potential deliverables within the biofuels sector, and with expectations that costs would eventually reach competitive levels with petroleum-only sources. Michael Sandoval is an energy industry consultant and a former energy policy analyst.